A study from the American Cancer Society showed a direct correlation between the amount of time people spend sitting and mortality rates. Sitting all day is just not healthy. According to a study of three schools in Texas, even kids do better standing. When given the opportunity to stand during classroom time, they burn more calories and appear to have greater attention spans. So it’s time to consider a standing desk for video editing. 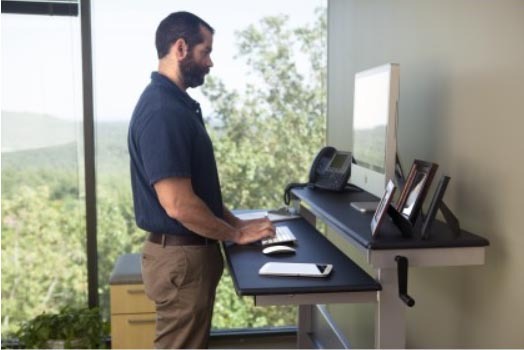 You’ll find there are many options which range from the power-adjustable desks from NextDesk (up to $2000) to the inexpensive standing desk hacks from Ikea for as little as $22. One of the Ikea hacks is probably a good place to start to make sure you like it. The downside to the Ikea hacks is that they are not adjustable. This is an Ikea hack standing desk for $22. You don’t want to stand all day either as there are health risks to that too. Best, is probably to use a variety of positions during the day. At the very least you should get up every hour or half hour and walk around or get some exercise.